Advanced Monitoring & Control, Inc. (AMCI) specializes in oil & gas pipeline monitoring and control. Products include CP rectifier and test station monitors, satellite synchronized interrupters, pressure monitors and automatic valve control. 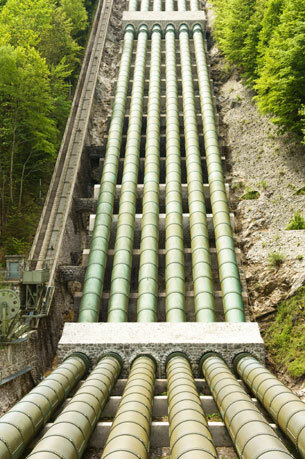 With over 10 years experience in pipeline monitoring & control, AMCI pioneered the use mesh technology and the use of unique power aware designs and algorithms that minimize power consumption; a single 5-volt non-hazardous lithium rechargeable battery is capable of powering most AMCI products for up to 10 years. These products are the ideal choice when conventional power sources are not available, or power surges represent a significant risk factor. Mesh technology allows dispersed wireless devices such as CP rectifiers and test station monitors collect data and relay it to a cellular or satellite gateway were information is then transmitted to data centers. Since only one internet connection is required for all devices within the range of the gateway, mesh network can provide a significant saving in both initial capital outlays and ongoing transmission costs. For example, a tank farm with 10-20 rectifiers might only require 1 or 2 internet gateways to collect and transmit data from a small, low-cost wireless mesh node at each rectifier. The AMCI pressure monitoring and valve control system represents a major advance over the traditional rate tank/differential pressure approach to detecting a linebreak. In a recent pipeline rupture, the system quickly detected a break 20 miles downstream and identified the ruptured pipeline (4 lines were on a common compressor station). The AMCI system uses multiple criteria to detect a linebreak. The changes in the pressure difference between pipelines on a common compressor station. Actual rate of drop (RoD) in pipeline pressure is measured; not the differential pressure change measured in the rate tank. Linebreak criteria can be modified for high consequence areas by increasing sampling rates, adjusting trip points, etc. No calibration charts are needed and a complete record of pipeline pressure is always available. The wireless mesh system eliminates the need to for Class 1, Div 1 wiring; installation is quick and efficient.